Jaime King is speaking out after her young son was involved in an “incredibly violent” car attack. On Wednesday afternoon, the Hart of Dixie actress’s 4-year-old son James Knight was struck by glass after a man allegedly attacked the parked car he was sitting in with a female friend of the actress in Beverly Hills. “Thank you so much to everyone for the outpouring of love we have received since yesterday’s attack. James Knight is very shaken up, as am I. 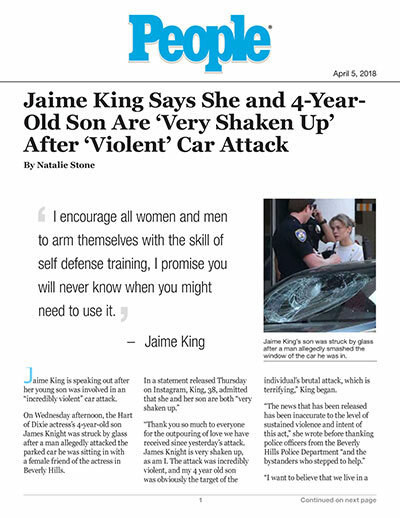 The attack was incredibly violent, and my 4 year old son was obviously the target of the individual’s brutal attack, which is terrifying,” King began. Jaime King's son was struck by glass after a man allegedly smashed the window of the car he was in “I encourage all women and men to arm themselves with the skill of self-defense training, I promise you will never know when you might need to use it,” she wrote. “I will do all I can so that no parent, child, person will have to be victimized as we have and that those in need receive the resources necessary,” she concluded.